I am a freak for reflective surfaces. I have been doing them since high school. It’s how I learned to draw. It’s all about shape. 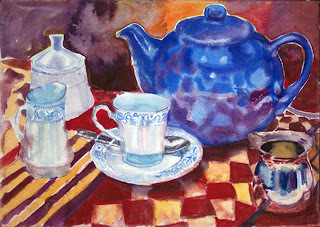 I have gotten a lot of mileage out of this blue teapot and the fabric. 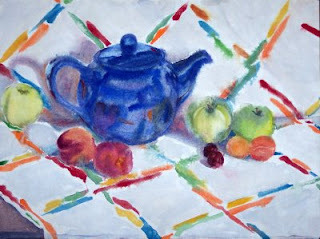 The fabric gives me just the right distribution of color to unite with the color of the teapot and fruit. The large area of white sets off the color. This is also very white paper so the color can ‘sing’. When I set up a still life, I am thinking about the color of the finished piece and how the whole can work together. I can arbitrarily change the color, but I find the results to be unsatisfactory when not actually observed. It rings truer when I can paint from the objects as they are. I am definitely a retinal artist. 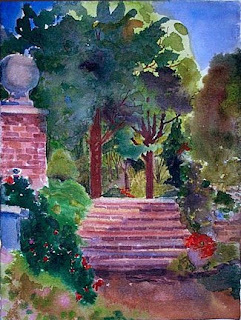 Watercolor is still my favorite medium. I can explore all kinds of ideas in full color quickly. Masa paper is a so reasonably priced that I can play to my heart’s content without feeling guilty about my profligate use of paper. Some models have so much intelligence and personality that just their walking into the room inspirational. This is one of those models. The group I am part of is a very chatty group and when a model can engage in the conversation, we love it. 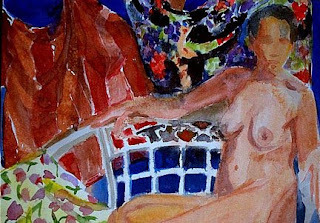 It give us an idea of who the model is and an inkling of how to express that in the work. Models are our artistic collaborators. 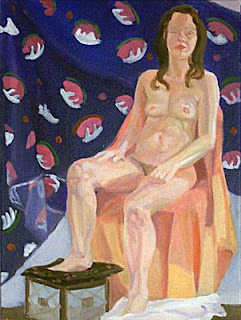 This is another in a series done with a Saturday cooperative figure drawing and painting group. We get together every Saturday for four hours. The model come twice so this was done over 2 sessions. Well temps have returned to the normal February averages. I was sure hoping they would remain more moderate for the duration of the season but no such luck. 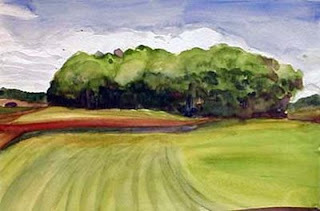 When you drive into the country in the midwest there are fields dotted with islands of trees. They are tiny archipelagos of lush greenery along the way. In Wisconsin it’s usually an area where the stones and gravel have been left over from the glaciers of the ice age melted. The stony land can’t be cultivated so it is left alone and the trees are ignored into maturity. There are also have a lot of stone “hedges” as stones are brought to the surface by the freezing and thawing of the ground over the winter and have to be collected before plowing. They get stacked as “hedges”. Yesterday it was 64 degrees in Chicagoland! It was VERY welcomed. Two feet+ has nearly completely melted! Now it’s raining. This winter has been one of the severest in recent memory. We have gotten away with some very mild winters the last few years and now we are paying for it. I fully expect more snow. That’s usually the case when temps rise in winter. So I am savoring this brief respite. 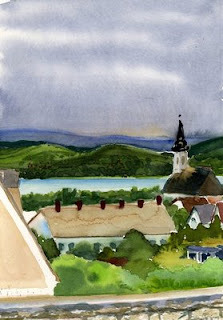 Enjoy the summer painting while waiting for spring!